Posted by Vicky Tiffany on Mar.23, 2017 17:54 PM. If you are one of those who is using their passcode on their iPhone as "1234" then it is time to stop because you are using one of the most easy-to-guess passcodes for your iPhone and compromising your own iPhone's security. After a careful evaluation and a survey conducted by top security companies, it is found that over 40% of iPhone users are using the following passcodes on their iPhones. Now, fortunately, these passcodes were not actually snooped during the survey to check who is using those passcodes but instead these information were collected anonymously by the iPhone users. But if any iPhone user is using those passcodes for their iPhone then it is time to stop reading this article and change it immediately. All of these passwords are really very easy to crack, even for a nine years old kid. A study says, if you are using a poor passcode then it will take less than 30 attempts for a hacker to crack your password and get into iPhone and steal all your personal data and information. Those who are using "0000", "1234" and "1111" as their passcodes are literally setting up a screen lock in intention of getting hacked. It is like you are locking up your car using a piece of thin string. And if you are using "0852" or "2580" then it's just because you sweeping your keypads up and down. There's a theory why people often use "5683" as their passcodes because it is said that it represents the word "LOVE" on their keypad which is why it is used so heavily. Anyways, you should never use these passcodes on your iPhone unless you want to compromise your own iPhone's security. So, what is the solution? Simple, just create stronger passcodes for your iPhone. Part 1. How to Generate Stronger Passcodes for your iPhone? One of the easiest way is to switch passphrase instead of passcode. If you use passphrase then you will not restricted to use only digits, instead you can use alphabets and digits mixing to make a stronger passcode. To make a passphrase, simply use the following method. 2) Tap on Touch ID & Passcodes. 3) Enter your current passcode to modify the changes and then scroll down and click on change passcode option. 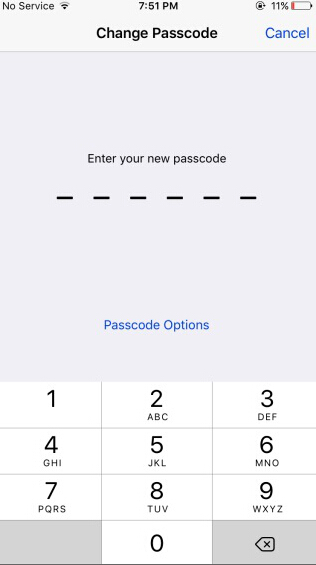 4) Input your passcode one more time and you will see the Passcode option. 5). Tap on the Passcode Options and you will be prompted with following options. 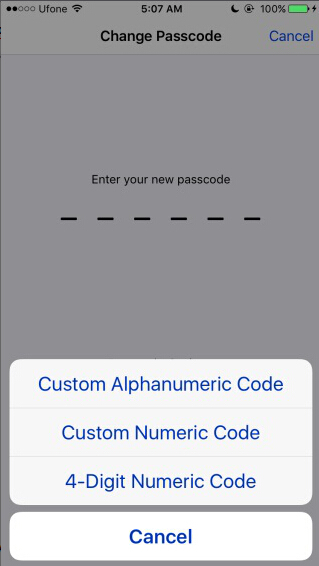 6) Tap on Custom Alphanumeric Code so that you can use both alphabets and numbers to make your new password. Use a stronger password and set it as your passcode. If you have troubles remembering your password then one of the best way to lock your screen is to use fingerprint lock screen apps to unlock your iPhone screen lock . For this, we will have to download external apps but it is absolutely worthy to secure your iPhone. If you forgot iTunes backup password, follow this article to learn how to unlock iPhone backup password. 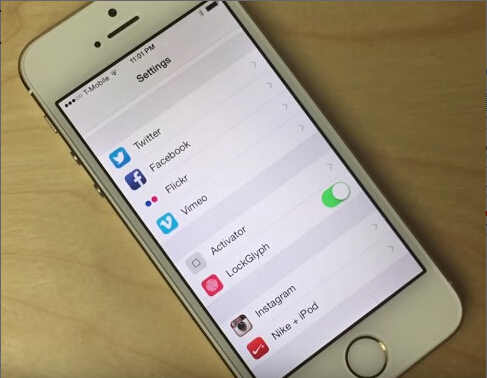 LockGlyph is a Cydia tweak application which helps you to lock your iPhone screen using the Apple touch animation. You just have to put your chosen finger in the home button and it will unlock your iPhone in two seconds. The application is absolutely free to use and you do not have to pay a single penny to download the app. So, after you have installed the app, follow the procedure to lock your iPhone. Step 1. 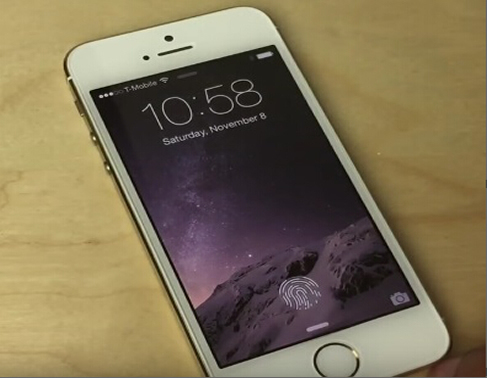 Download and install LockGlyph in your iPhone. Step 3. From here, you can enable or disable LockGlyph. After that you just need to put your chosen finger in the home button and your iPhone will be unlocked. Do not be like one of those people who uses super easy passcodes to secure there iPhones which may take literally two seconds to hack. Securing your iPhone is very important these days so that you can keep you iPhone away from strangers, family and friends. Even if they get your iPhone they won't be able to use it without your passcode. Always make your passcodes as hard as you can to guess. Hopefully the above methods will be useful enough to secure your iPhone better.